So many of us! So many of us! IT’S that time of year again, when the food safety people start pleading with us anew not to poison ourselves. Well, in truth, the food safety people are nearly always pleading with us not to poison ourselves – a Safefood type is forever standing over your shoulder in the kitchen and then (having furtively measured your waistline) falling into a hysterical faint because your dishcloth hasn’t been changed in two days and is therefore waging merciless biological warfare against western civilisation. However, usually they’re referring to accidental food poisoning, rather than what you might call the intentional kind. This time of year it’s about the dangers of eating wild mushrooms. And if you have poisoned yourself by picking and eating wild mushrooms, then – at the risk of offending the luckless – it has to be said of you that you have at least connived in your own fate. These mushroom-warning stories appear seemingly overnight, in great multitudes, every autumn. You just wake up one morning in October and there they are, in abundance, all over the papers. But it’s hard to know whom they’re aimed at. Is there an assumption among the health authorities, shared by the media, that there are people out there who somehow still do not know that some mushrooms are poisonous? If so, who can these people possibly be? And what have they been doing until now that has sheltered them so effectively from the knowledge? Most important of all, which unhappy combination of whim and circumstance has led them to go out mushroom-hunting, of all things? It’s easy to see the attraction. Mushrooms are so bewitching, so diverse, so… so pleasingly eerie. They’re neither plant nor animal, yet are full of lore – and almost comically plentiful. As Sylvia Plath wrote in her eccentric 1960 poem, ‘Mushrooms’, “So many of us! So many of us!”, which – with all due respect to the poet – sounds better when read in a Pinky and Perky voice, I think you’ll agree. But if there really are people who don’t know that mushrooms can be poisonous, then clearly they are the sort of people who don’t read the newspapers anyway, so it’s unlikely the warnings are aimed at them. That means that possibly the food safety authorities are directing their advice at a little-understood second group – those who know that some mushrooms are poisonous but who don’t care. This group must include those hardy free food advocates who are constantly boiling up nameless molluscs in their kitchens and exhorting you to eat them. They’re forever banging on about seaweed. They cannot understand how you can derive more pleasure from looking at your nasturtiums than from eating them; to them, “can be eaten” is the same thing as “should be eaten”. They brew coffee with dandelion roots and have the nerve to call it coffee. They make – oh God – they make their own wine. And they think they know their chanterelles from their false chanterelles, their Agaricus from their Amanita, but they don’t. And they won’t be told. This group are probably also beyond the help of the health authorities as well, since they’re not the type to take instructions from anyone – well, maybe from Ray Mears, but not from anybody else. So who is left who can possibly benefit from these hardy annual warnings about the dangerous of eating wild mushrooms? Could it be that all the cautionary tales are aimed at the one group of mushroom-hunters that dare not speak its name – the group who, upholding a tradition that dates at least as far back as Cú Chulainn, like to gather magic mushrooms at this time of year? If so, all the warnings are still a waste of time. 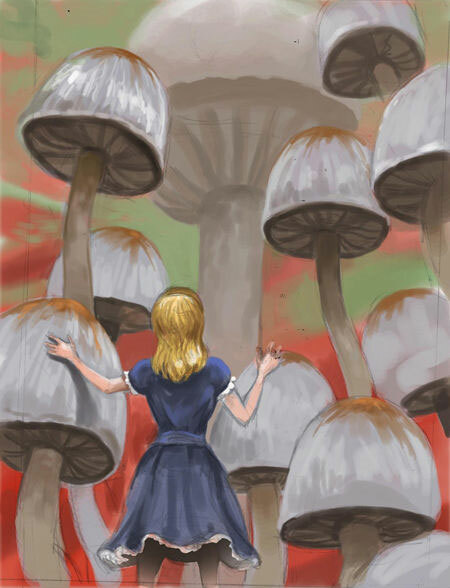 Magic mushroom eaters are not likely to pay any attention to the food safety authorities either. They might take advice from someone who has picked magic mushrooms before, and who can therefore reliably identify them. Having taken that advice, they might then be persuaded to take the advice of a caterpillar sitting on a mushroom smoking a hookah, if the advice went something like the lines of: “One side will make you grow taller, and the other side will make you grow shorter”. But they don’t take advice from The Man. Eithne Tynan is a freelance journalist, formerly radio critic of the late Sunday Tribune and now contributing to the Irish Daily Mail and Mail on Sunday. This blog begins as a lazy collection of bits of her print journalism.